Sixty-five million years ago, life on Earth was sorely tested. One or more catastrophic events including a massive asteroid strike and increased volcanic activity, created wildfires on a global scale and dust clouds that cut the planet’s surface off from the sun’s vital light. The majority of animal species went extinct including, most famously, the dinosaurs. The fate of the planet’s plants is less familiar, but 60% of those also perished. What separated the survivors from the deceased? How did some species cross this so-called “K/T boundary”? Jeffrey Fawcett form the Flanders Institute for Biotechnology thinks that the answer lies in their genomes and specifically how many copies they have. Geneticists have found that the majority of plants have duplicated their entire portfolio of genetic material at some point in their evolution. They are called “polyploids” – species with multiple copies of the same genome. By dating these doublings, Fawcett had found that the most recent of them cluster at a specific point in geological time – 65 million years ago, at the K/T boundary. It suggests that having extra copies of their genomes on hand gave these plants the edge they needed to cope with the dramatic environmental changes that wiped out the dinosaurs and other less well-endowed species. Walking on two legs, or bipedalism, immediately sets us apart form other apes. It frees our arms for using tools and weapons and is a key part of our evolutionary success. Scientists have put forward a few theories to explain how our upright gait evolved, but the ‘savannah theory‘ is by far the most prolific. Our arms provide a further clue. Even though our ancestors’ back legs quickly picked up adaptations for bipedalism, they steadfastly kept long, grasping arms, an adaptation more suited to moving through branches. To Susannah Thorpe at the University of Birmingham, these are signs that bipedalism evolved while our ancestors were still living in trees. 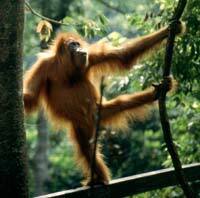 And she has found new support for this theory by studying Sumatra’s orang-utans, who occasionally take to two legs to negotiate tricky canopies. There are so many fascinating stories about parasitic wasps that they have become a regular feature in this blog. Usually, their prey come off poorly in these tales, with caterpillars being reduced to little more than living, paralysed larders for macabre wasp grubs. But not always – some hosts don’t take the invasion of their bodies lying down. This post is an attempt to redress the balance between parasite and host, by telling the story of the caterpillar that fights back… with medicine. One species of tiger moth, Grammia incorrupta, has a fuzzy caterpillar called the woolly bear. Like most other caterpillars, it’s exploited by several species of parasitoids including flies and wasps. If these body-snatchers lay their eggs inside a caterpillar, its menu changes and it develops a preference for a group of plant toxins called pyrrolizidine alkaloids (PA). These have no nutritional value and they clearly come at a cost, for woolly bears that eat a PA-rich diet grow more slowly than their peers. And yet, infected caterpillars gulp down these poisons by the leaf-ful. They are the medicine that the caterpillar uses to kill its unwanted hitchhikers. Want to know how much you’d enjoy an experience? You’re better off asking someone who has been through it, even if they’re a complete stranger, than to find out information for yourself. This advice comes from Daniel Gilbert from Harvard University, who espoused it in his superb book Stumbling on Happiness. Now, he has found new support for the idea by studying speed-daters and people receiving feedback from their peers. In the first study, he found that female students were better able to predict how much they would enjoy a speed-date if they listened to the experiences of strangers than if they make their own assessments based on available information. Likewise, the second study found that people more accurately foresaw their reactions to criticism when they knew how someone else had reacted than when they had the information for themselves. This interesting result masks a second one of equal importance – people don’t believe that this works. In both cases, most volunteers felt that they would be better off relying on their own counsel than to lean on the opinions of others. In some ways, that’s not surprising – it is, after all, a fairly counter-intuitive idea. But it also comes on the back of a huge amount of evidence that we humans are really very bad at predicting what will make us happy. Time and again, psychological studies have found that we overestimate how happy we will be after winning a prize, starting a new relationship or taking revenge against those who have wronged us. We also overrate our disappointment at bad test results, disability or failure to progress at work. Try as we might, we consistently fail to forecast our own emotional reactions, and we even fail to accurately remember our past experiences to be used as guides. Gilbert says that the main reason for this is an inability to accurately imagine future events. We can close our eyes and try to picture ourselves in the future but we focus on the wrong things, we predict that our emotions will last longer than they do, and so on. Some scientists have tried to improve things by training people to mentally time-travel with more accuracy but these attempts have been largely unsuccessful. Gilbert advocates a different ethos – use other people as living simulators. In most cases, you can find someone who has been through the same experience, and they can act as a mental surrogate. Having actually lived through the experience you’re trying to picture yourself going through, they are resistant to many of the mistakes we naturally make in our predictions. What happens when you find a feathered dinosaur that really isn’t meant to have feathers? That’s the question set by a spectacular new fossil that adds a confusing dimension to the origin of feathers. The concept of dinosaurs with feathers is no longer surprising. Birds certainly have them and they are now considered to be living dinosaurs. The infamous Velociraptor and its relatives were covered in plumes, which ranged from the simple quills of Sinosauropteryx to the flight-capable plumes on Microraptor‘s four wings. We know about these prehistoric feathers through the beautiful fossil impressions they have left behind, but a new set of impressions may be the most impressive yet. They were discovered by Chinese scientists led by Xiao-Ting Zheng, who named their new discovery Tianyulong confuciusi, after the museum that Zheng works in and the famous Chinese philosopher. Its small, agile body, about the size of a cat, was covered in long, hollow filaments that closely resemble the primitive “proto-feathers” (or colloquially, “dinofuzz”) of other dinosaurs. What makes Tianyulong unique is that it is a very distant relative of all these other feathered species. So far, all feathered dinosaurs are theropods, a group of two-legged and (mostly) carnivorous animals that included Tyrannosaurus and Velociraptor, and indeed, modern birds. The theropods belong one of the two major groups of dinosaurs, the Saurischia. Tianyulong, however, is a clear member of the other dinosaur lineage, the Ornithischia, which include the various armoured, horned, spiked and duck-billed species. This is the first time that anyone has discovered an ornithischian with feather-like structures all over its body. More specifically, Tianyulong is a heterodontosaur, a group of small plant-eaters that are the most primitive of the ornithischians. Its position in the dinosaur family tree raises big questions about the origins of feathers. If its filaments are related to the proto-feathers of the theropods (which is possible but not certain), they either evolved independently or were derived from filaments that covered the very earliest of dinosaurs. The giant cephalopods (squids and octopuses) of the deep sea have captured the imagination for centuries. But despite our fascination with these creatures, they are still enigmas, their behaviour illuminated only by the occasional lucky video or the presence of scars on animals they fight with. For many species, including the famous giant squid, we still know relatively little about what they eat and what position they occupy in their ecosystems. Yves Cherel from the Centre d’Etudes Biologiques de Chize has some new answers about the behaviour of deep-sea cephalopods and they came from a most unorthodox technique– he studied remains recovered from the stomachs of dead sperm whales. It’s clear that sperm whales feed on squid and octopuses. Sucker-shaped scars along the backs of some individuals have led people to picture titanic battles between the whales and their giant prey. Once eaten, the cephalopods’ soft bodies are easily digested, but they also have hard, parrot-like beaks that aren’t easily broken down. By looking in the stomachs of three sperm whales stranded in the Bay of Biscay, Cherel recovered hundreds of beaks from 19 separate species – 17 squids including the giant squid, the seven-arm octopus (the largest in the world) and the bizarre vampire squid. Together, these species represent a decent spread of the full diversity of deep-sea cephalopods. Farmers and herders have known for centuries that herds of cattle have an uncanny ability to all point in the same direction. Last year, a group of German and Czech scientists discovered the reason behind this alignment – unbeknownst to humans for thousands of years of domestication, these animals have a magnetic sense. The team used Google Earth satellite images to rule out alternative explanations like the wind and the sun, and show that cow and deer herds tend to point towards magnetic north like a living, hoofed compass needle. Now, the same team have found that high-voltage power lines, which emit strong magnetic fields of their own, disrupt the orientation of cattle and deer. Near these lines, their neat alignment goes astray and they position themselves at random. This disturbance becomes less and less pronounced as the animals stray further away from the power lines. This is yet further proof that cows and deer have a magnetic sense that’s only just become apparent to us. A wide variety of animals navigate using the Earth’s magnetic field as a guide, but until recently, bats and rodents (including hamsters, mice and mole rats) were the only mammals to demonstrate this sense. In fact, the ability may be much more widespread, for these groups are small and easily tested in the kinds of laboratory experiments that would be impossible with larger creatures. To study the senses of cows and deer, Hynek Burda from the University of Duisberg-Essen was forced to be more creative. He used pictures of herds of animals taken by Google Earth’s satellites to show that they line up according to the North-South poles, regardless of the position of the sun and in parts of the world with very different prevailing winds. In this new study, he made use of large magnetic anomalies caused by the presence of power lines to see if the animals’ behaviour was affected. The effect that violent films and games have on our minds, and the implications for their place in society, has been a source of much heated debate. Now, a new study looks set to fan the flames even further. Several studies have found that violent media can desensitise people to real acts of violence, but Brad Bushman from the University of Michigan and Craig Anderson from Iowa State University have produced the first evidence that this can actually change a person’s behaviour, affecting their decisions to help others in need. In the first study, Bushman and Anderson recruited 320 students under the pretence of studying their tastes in video games. The recruits played 20 minutes of either a violent video game (Carmageddon, Duke Nukem, Mortal Kombat or Future Cop) or a non-violent one (Glider Pro, 3D Pinball, Austin Powers or Tetra Madness). After playing, the recruits were left alone to fill in a questionnaire. They wrote their favourite type of video game (fighting, fantasy, skill, sports and so on) followed by over 200 questions on such games. This massive list of questions was a red herring, designed to keep the volunteers busy. Three minutes into the time, Bushman and Anderson played a recording outside the room of two actors fighting about how one stole the other’s partner. The actors’ gender was matched to the recruit inside and the two quickly descended into a shouting match and came to blows. 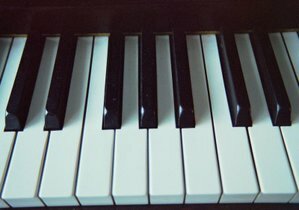 Have you ever looked at a piano keyboard and wondered why the notes of an octave were divided up into seven white keys and five black ones? After all, the sounds that lie between one C and another form a continuous range of frequencies. And yet, throughout history and across different cultures, we have consistently divided them into these set of twelve semi-tones. Now, Deborah Ross and colleagues from DukeUniversity have found the answer. These musical intervals actually reflect the sounds of our own speech, and are hidden in the vowels we use. Musical scales just sound right because they match the frequency ratios that our brains are primed to detect. When you talk, your larynx produces sound waves which resonate through your throats. The rest of your vocal tract -your lips, tongue, mouth and more – act as a living, flexible organ pipe, that shifts in shape to change the characteristics of these waves. What eventually escapes from our mouths is a combination of sound waves travelling at different frequencies, some louder than others. The loudest frequencies are called formants, and different vowels have different ‘formant signature’. Our brains use these to distinguish between different vowel sounds. The songs of birds certainly sound beautiful to our ears but listen closely and you’ll hear a world of conflict and subterfuge. Take the Preuvian warbling antbird (Hypocnemis peruviana). Males and females live in pairs and they will defend their territories from other duos by singing beautifully coordinated duets. Theirs is a most melodious partnership but throw another female into the mix and the harmony breaks down. The duet turns into an acoustic battle – the female tries to jam the song of her partner with her own, so that the notes of his amorous solo fail to reach the ears of the intruder. The male in turn adjusts his song to avoid his mate’s interference. Joseph Tobias and Nathalie Sneddon uncovered this complicated sonic rivalry by recording 27 pairs of wild warbling antbirds in their natural environment in Peru. Males and females sing different tunes and their duets consist of a regular series of couplets – the male always leads and the female chimes in immediately after. These couplets require split-second timing. If she comes in any earlier, the female interferes with the male’s song. But she often does. The quicker she responds to his song, the greater the interference, and the more likely the male is to take counter-measures. If he’s being sung over, the male abandons his current son and just begins a new one after the female finishes. In very rare situations, she jams him again, and the cycle continues.